Ownership / Access: Used as a conference and wedding venue. 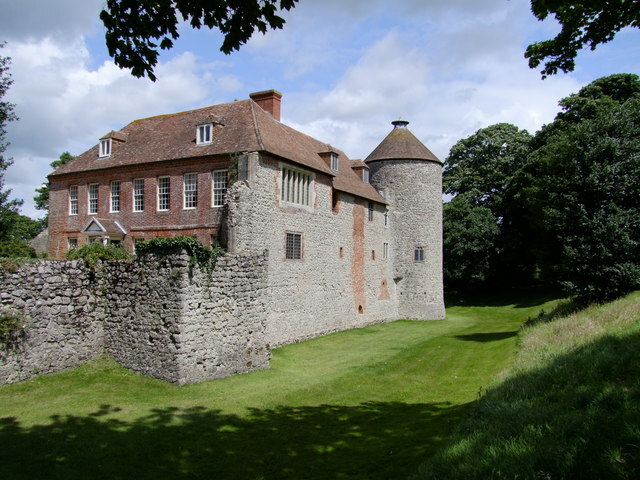 Notes: Westenhanger Castle is a fortified manor house once owned by royalty, located next to Westenhanger railway station and the grandstand of Folkestone Racecourse in Kent. The castle has endured a period of steady decline to near ruination in recent years, but the current owners have engaged a programme of consolidation, conservation and restoration to the castle and adjoining buildings. It is now being used as a conference and wedding venue. Through the centuries, the castle has been reduced in size and suffered serious neglect. Since the mid 1990s, the current owners have been working with English Heritage to consolidate the stonework and prevent further deterioration of the manor house, castle walls and associated buildings. The impressive medieval barns which stand intact outside the curtain wall have recently been reunited with the castle under one ownership and work is ongoing to restore these barns to something near their original state. It is now being hired out as a conference and wedding venue. Access is via the entrance to the racecourse, off the Westenhanger segment of Stone Street.